ESR | March 14, 2005 | Jail: The best treatment for mental illness? Jail: The best treatment for mental illness? My brand of conservatism is cultural conservatism. It's a completely different strand of thought than extreme libertarianism which sees no real place for government at all. Cultural conservatism believes in limited government and we often work in coalition with sensible libertarians and more free-market-oriented conservatives on important issues upon which we agree, namely reducing the size of the Federal Government. One important distinguishing feature of cultural conservatism is that we believe in upholding the importance of traditional values in a community. We also are concerned for those who cannot truly care for themselves but we place more faith in private and religious institutions than in government bureaucracies to truly help those in need. 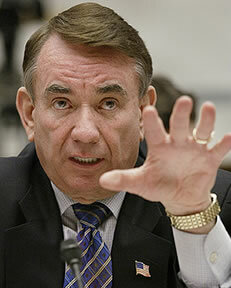 Conservatives such as Tommy Thompson, when he was Governor of Wisconsin, demonstrated that concern when he promoted welfare reform. Many people in his state were ticked off -- rightly so -- that people would receive government checks in lieu of working. They would have children without being able to support them independently. Thompson realized that the hardworking taxpayers had a legitimate gripe. He also knew that the welfare recipients were really the biggest victims. The government helped to lock them into poverty without providing the motivation to improve their lot in life. Worse, the odds were that their children would also become trapped in that same poverty. Thompson pushed the boundaries by obtaining waivers from the Federal Government to permit the State Government to require welfare recipients to hold jobs in order to receive their benefits. Wisconsin's efforts to break the cycle of poverty that started under Thompson continue. CATO Institute issued a state report card on welfare reform last year. Wisconsin received an "A" for its program. "Thanks to Wisconsin's innovative Work First and Pay for Performance programs, plus the very real threat that nonworking people will simply be cut off, almost 67 percent of welfare recipients are working," wrote CATO Institute welfare policy analyst Jennifer Zeigler. Thompson's leadership in reforming welfare helped to trigger a national revolution for the better. Wisconsin's welfare reform helped demonstrate to the poor that they could break the government chains that perpetuated their poverty. Left to the will of the government's bureaucrats in the state social service agencies, it's unlikely that welfare reform would ever have occurred. Some people are truly helpless. America's mentally ill have been placed on the streets, often ill prepared or not being provided the medical care they need. This started during the 1960s when the state-operated hospitals for the mentally ill fell under fire for their poor management. Organizations such as the American Civil Liberties Union exacerbated the problem by pushing for deinstitutionalization. A lack of affordable housing, particularly the disappearance of single-residence occupancy housing, helped to exacerbate the problem. Turning the mentally ill out of the institutions brought about results that proved to be as disappointing as when they were in mismanaged institutions. The result is that many mentally ill are homeless, wandering the streets, sometimes even posing a danger to the community, because their illness is untreated. It's quite likely you have seen an unkempt person acting belligerently, even threateningly, behaving in a manner as no rational person ever would dream of behaving. That person is mentally ill and the likelihood is that he has fallen through the cracks of our system particularly if he has no family or comes from one without the means to pay for expensive treatments. However, there is a new de facto hospital for the mentally ill: America's prison system. The mentally ill, left to fend for themselves, often end up running afoul of law enforcement because of their aggressive behavior. Some very well may have broken the law but quite often the police do not understand the mentally ill person is displaying symptoms of illness. The police often do not realize that the mentally ill have grandiose feelings and that makes them very difficult to handle, adding to the burden already upon the police. The problem is that the prisons are no place to house those who truly are mentally ill. When Cheri Nolan, Deputy Assistant Attorney General, Office of Justice Programs, testified before the House Judiciary Committee's Subcommittee on Crime, Terrorism and Homeland Security last year she stated: "If the crime is serious, incarceration is the appropriate response, regardless of whether the perpetrator has a mental illness. Our policy is clear: we will not absolve someone of any responsibility for committing a crime simply because he or she has a mental illness." Nolan explained that many of the mentally ill are jailed for committing low-level crimes only to be placed on the streets where they will once again commit the same crimes. In this case the justice system is equivalent to the dog chasing its tail endlessly. The mentally ill who are jailed are strong candidates for return visits once they are released. Ms. Nolan testified that the Los Angeles County Board of Supervisor's Task Force on Incarcerated Mentally Ill found that 90 percent of the county's inmates who have mental illnesses are repeat offenders. Too many mentally ill leave jails where their needs for treatment have not been provided, ending up on the streets without the needed connections for treatment, housing and the support services they need and the result is they end up in prison once more. Many localities and states are failing to come to terms with the problem of the mentally ill. The Treatment Advocacy Center says eight states do not mandate treatment in the community setting -- Connecticut, Maine, Maryland, Massachusetts, Nevada, New Jersey, New Mexico and Tennessee. This can help push the mentally ill into the hands of law enforcement and prison guards rather than medical personnel. Pennsylvania's law governing the treatment of the mentally ill has required since the mid-1970s that dangerousness be a determining condition for arrests. Philadelphia's Police Chief ordered that the mentally ill be arrested for disorderly conduct rather than placed into custody under the Mental Health Act. The Treatment Advocacy Center in a February 2005 briefing paper on "Law Enforcement and People with Severe Mental Illnesses" says "That practice continues today when officers and deputies find there is no way to get psychiatric help for a person who is psychotic but not yet obviously dangerous." Steve Leifman, a Judge who sits on Florida's Eleventh Circuit, which covers Miami-Dade County, explained the problem in a letter posted on January 9, 2005 on the Miami Herald's Miami.com website: "[People with mental illness] are arrested and jailed for minor offenses and nuisance behavior, such as disorderly conduct or trespassing. Once incarcerated, they remain jailed eight times longer -- and at a cost that is seven times greater -- than those without mental illnesses arrested for the same offenses." The Judicial Circuit upon which he serves instituted a program to divert the mentally ill from the criminal justice system to obtain treatment for their illnesses. Law officers have received training in how to recognize and to better deal with the mentally ill. Leifman wrote that the recidivism rate among the mentally ill in Dade County has fallen dramatically and that taxpayers are saved over $2.3 million annually. Memphis' police force has a special crisis intervention team which personnel specifically are trained to handle people with mental illnesses. The Treatment Advocacy Center states that police's Crisis Intervention Team (CIT) personnel "learn to interact with people with mental illness who are in crisis in a way that de-escalates, rather than inflames a tense situation. CIT officers can also divert a person to a mental health treatment facility rather than jail when appropriate." Portland, Oregon, Seattle, Houston and San Jose are some other cities that are using similar approaches. More effort needs to be put forth to assure the police understand the problems of the mentally ill and how best to deal with them. In many cases sensible treatment is vastly preferable in terms of cost and compassion than incarceration. A return to institutionalization may be warranted for some hard-luck cases although it will be important to administer the facilities well to prevent the scandals that helped fuel the drive for deinstitutionalization in the first place. It's important that the law enforcement and the courts seek to provide appropriate responses to the mentally ill who have yet to commit true crimes of violence. Ensuring they receive treatment may even help to prevent even worse crimes from occurring. "Go directly to jail" is not the right path to take in such cases.